Everyone who reads the novel Messages from Estillyen will undoubtedly engage Scripture. The ancient texts of Scripture, woven throughout the storyline, give the novel a timeless core of worth and meaning. It seems fitting, therefore, that the Estillyen website should feature a section, albeit brief, regarding the matter of Scripture Engagement. What Does Scripture Engagement Really Mean? 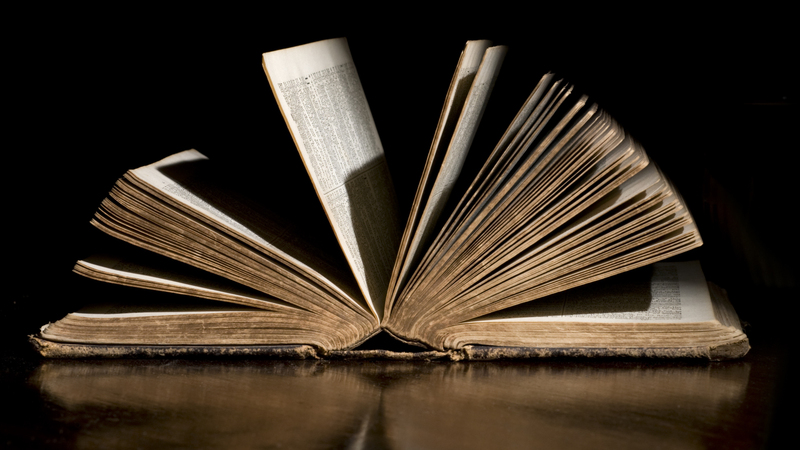 Engaging Scripture is not a magical process whereby sinners are formed into saints. Nor is it a litmus test spiritual maturity. It’s fair to say, though, that spiritual growth and Scripture engagement tend to go hand in hand. Even so, people engage Scripture for a host of reasons, and the effect of engagement is never a foregone conclusion. What many cherish and take to heart, others scorn and ridicule. Always at play is the factor of human will. Scripture’s words and lines do not move upon the mind, like mist, filling voids and non-engagement. Message engagement is a perpetual process, an inescapable element of life. The force is constant. Daily, roundabout us, attractive and alternative messages swirl. With quickened pace they arrive, not retreating. Words battle; messages compete. Stories collide, morph and move along. 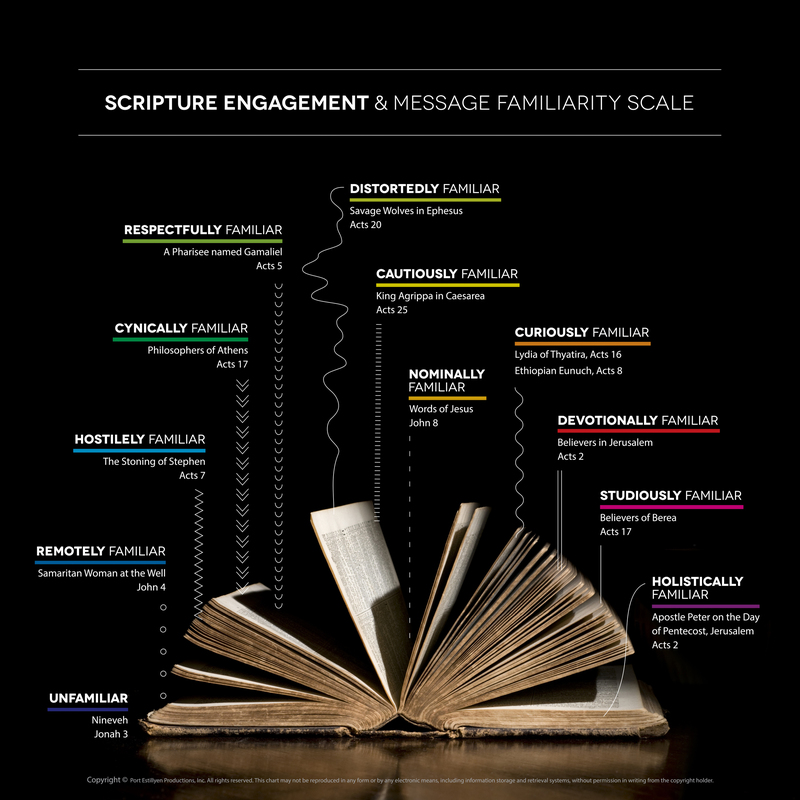 Into a vibrant landscape of message engagement, the words of Scripture flow. The overarching aim of Scripture is to draw readers and hearers into the enduring work of God, centered in the person of Jesus Christ. In this respect, Scripture both reveals the divine choreography of redemption while possessing the power to redeem. This unique and inspired raison d’être sets Scripture apart from all other literary works. Scripture’s ability to engage those who engage it is an unparalleled feat. The withers of time itself cannot tarnish or diminish the relevance of the text. The Scriptures speak forcefully of this effect: “For the word of God is living and active, sharper than any two-edged sword, piercing to the division of soul and of spirit, of joints and of marrow, and discerning the thoughts and intentions of the heart” (Hebrews 4:12). While this piercing process is always personal, the “living and active” work of Scripture cannot be contained in private space. The “working out of one’s salvation” requires community. The intentionally of Scripture is rooted in community, the Church. There, the meaning of Scripture is fleshed out, taking on the reciprocal role for which it was divinely commissioned. Further, Scripture is a divine drama, in which everyone, everywhere, knowingly or not, has a part to play. Scripture engagement is a way of centering yourself in this drama. Characters of old speak tellingly into our present-day realties. We consider their roles, ponder their lines, and reckon with their fate. Characters of biblical acclaim portray us, and, in turn, we portray them. The repentant and unrepentant alike we model. We enter the story. We stand amidst the crowds. We gaze, we ponder, we choose the part we dare to play—apathy, indignation, believer, unbeliever. That’s the way Scripture works. There’s no shortcut, no Snapchat solution to the efficacy of Scripture engagement. Scripture engagement is not the end of the means; it’s a means to an end. The end of the means is redemption, which leads to the person of Christ. In Christ alone are the medium and the message one and the same. 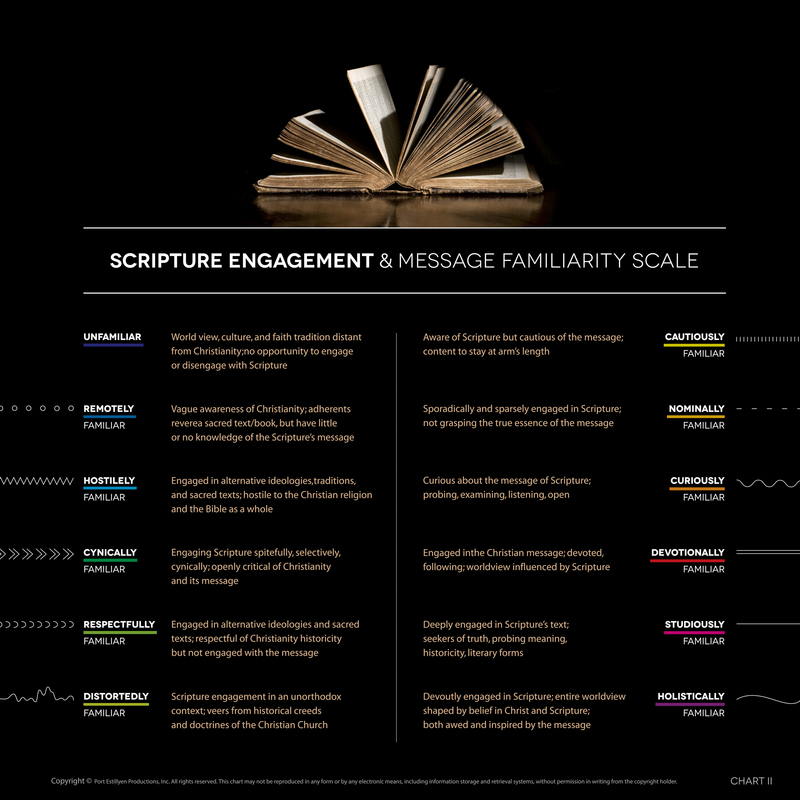 To help illustrate the diversity of Scripture Engagement, Port Estillyen Productions(PEP) has developed the Scripture Engagement and Message Perception Scale. Please note: you can click or tap on the following images to make them bigger. Chart One illustrates milestones of message familiarity. There are twelve in all, ranging from Unfamiliar to Holistically Familiar. The latter is the aim. Chart Twobuilds on chart one, providing annotated descriptors for each of the twelve milestones of message familiarity. 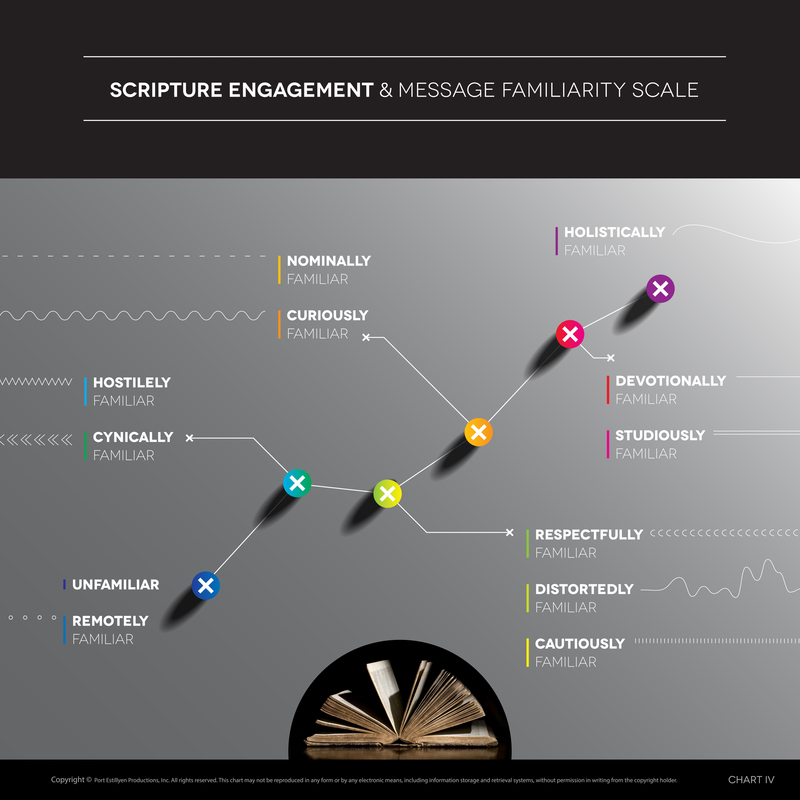 Chart Four is provided as an aid in message production that inspires Scripture Engagement. Einstein got it right, we suggest. Just the same, knowledge we need. Therefore, Port Estillyen Productions invites institutions and individuals to engage in research, related to the Scripture Engagement and Message Familiarity Scale. We welcome feedback and discussion.